The parish of Durness is one of my favourite destinations in Scotland. This would be a full day’s visit from Ullapool but again very much worth the while. The journey on the coastal road is worth the trip alone. One leaves Wester Ross and enters the county of Sutherland on this road and the scenery does take on a quite different aspect from the sights of the Assynt district around Ullapool. I believe the rock is called Pink Gneiss. Driving along through it does remind one slightly of being on the moon and let it be remembered that the area is officially classed as a word desert area. A quick sight you may want to see is but a few miles up the road frmo Ullapool on the coastal road at Elphin. Standing alone to the right of the road are the Elphin Tearooms. There’s usually a coach party or two there – one of those places to ignore you may think. Look beyond that thought for a minute however if Golden Eagles interest you – you will almost certainly be guaranteed view of the lord of the skies above and beyond the tea room. 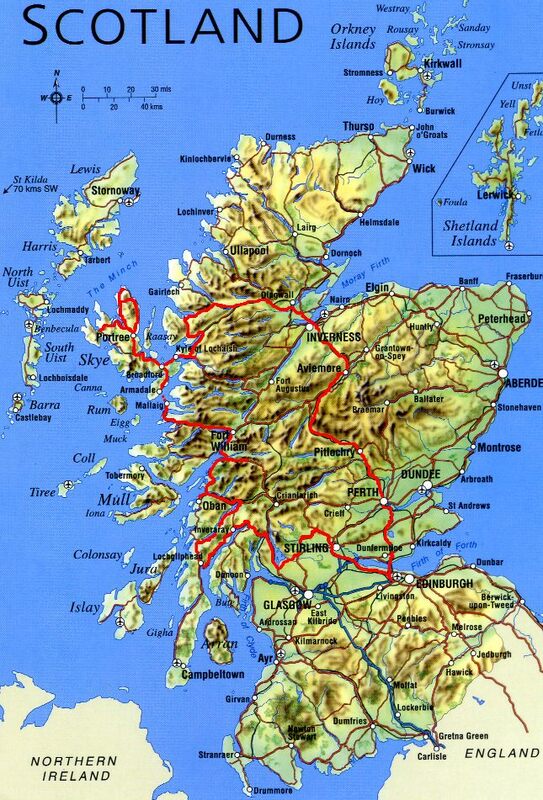 They’re quite an awe-inspiring and majestic sight and one I always like to associate with the Highlands of Scotland. Along the road you’ll pass by pretty villages occasionally such as the Nordic-named Kyleskue with it’s proud new bridge. 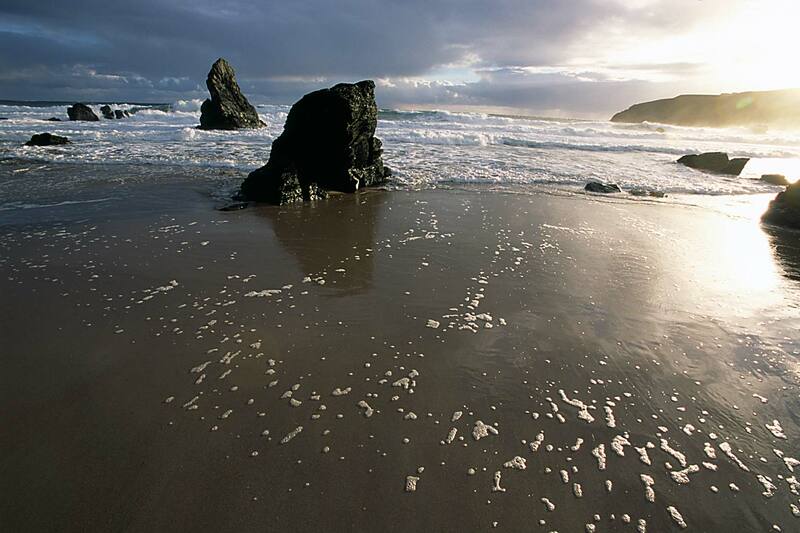 You may want to head straight to Durness however as there lays a wonderful visit ahead of you. The pictures above almost do Durness justice but not quite! 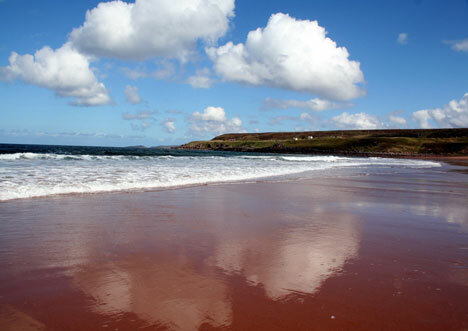 Huge sheer cliffs, sea birds such as puffins and white sandy beaches complete a heavenly scene. Perhaps don’t look for a central village in Durness as there really isn’t one, just scattered homes and the odd businesses here and there in true parish style. 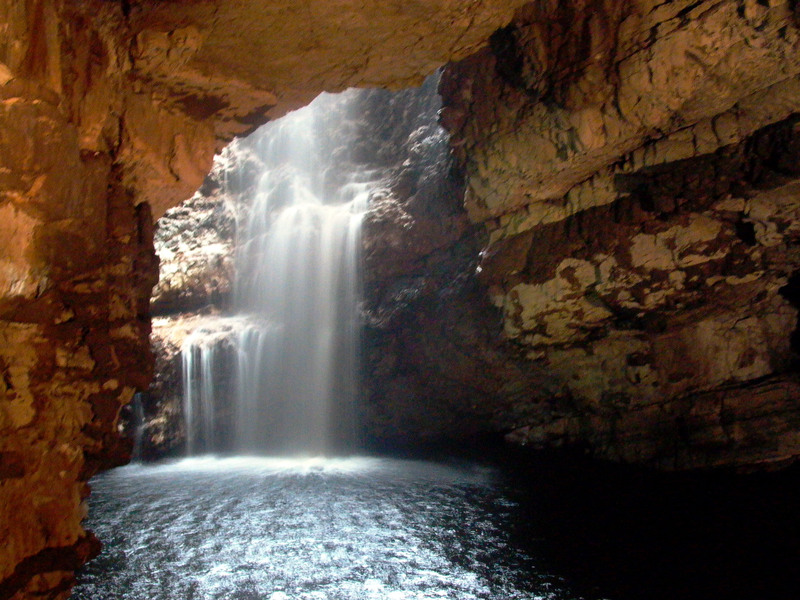 A must see in Durness is Smoo Cave which I believe is the second largest in the UK. Walk inside it and explore or take one of the boat trips into the huge cavern. A little-known fact about Durness is that John Lennon used to visit here regularly as a youngster as he had family there. I believe a cousin still stays there. Before leaving the area might I suggest a rather unusual visit? Balnakeil Craft Village lies just west of Durness. It’s a World War II military encampment that is now used by various artists and craftsmen selling their wares. A very intriguing wander can be had around the little walk-in studios of this isolated community before heading back south to Ullapool. 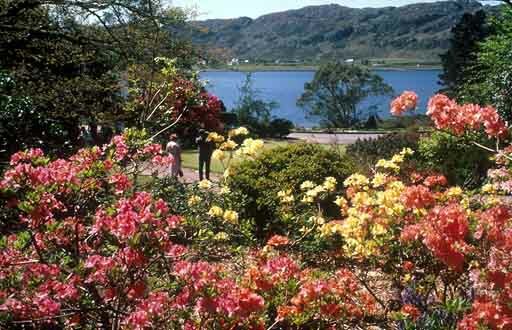 I’d make the suggestion of Plockton as a lunch stop on the way to Ullapool perhaps. This is one of the most attractive villages one is likely to see anywhere – indeed it is often billed as Scotland’s prettiest village. 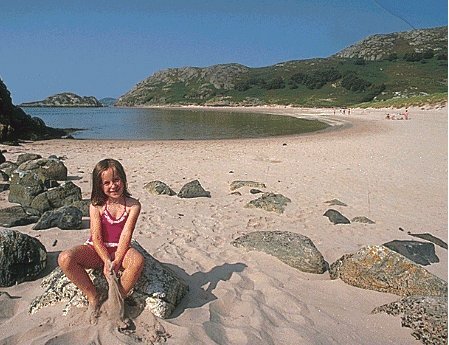 Plockton is basically a long curving bay lined with palm trees due to the temperate climate provided by the Gulf Stream that this area of Scotland benefits from. Out in the bay sits an island which adds to the visual appeal. 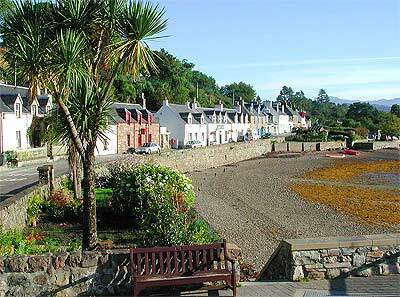 Plockton was renowned as the setting for a British comedy drama series called ‘Hamish Macbeth’ – the comedic and wry tales of a Highland policeman which was highly rated a few years back. Applecross takes a little effort to get to but is well worth it. It’s a possibility as a visit on your way to Ullapool but probably more practical to take a day out from Ullapool and perhaps combine it with a visit to Gairloch (more of later). The road over to the peninsula is most memorable and known as ‘The Pass of the Cattle. It’s an old droving road over the mountains where Highland farmers would have their livestock taken to lowland markets, much like the spectacular Mam Ratagan Pass over to Glenelg. The pass is narrow, steep and has sharp switchbacks, it’s unlikely that you’ll forget this journey! Once past the viewpoint at the hilltop with fantastic views over the bay, one drops down into the small v illage tucked neatly in by the waterside. There’s a lovely old inn here to take lunch. From the village of Applecross I’d suggest a drive north around the peninsula. There really are wonderful views as you take the road which hugs the bay. Along the road can be seen ancient ruined crofts as the migrants to Canada left them in the 1800s’, a very touching and humbling experience as you imagine what went through those poor people’s minds before they left their homeland for ever. Further on are some quite spectacular, wide sweeping beaches of white sand. You can have them practically to yourself too! Some of you will be familiar with this tiny Highland village though many are unaware of its location and appeal. Allow me to introduce you to Glenelg, one of the true hidden gems of Scotland. From the main ‘road to the Isles’ up the west coast an abrupt turn over Shiel Bridge takes us onto the Mam Rattagan pass which is a totally memorable drive, albeit not for the faint-hearted. Make sure and take a peak from behind the wheel at the fabulous viewpoint offering views over to The Five Sister’s of Kintail mountains due east, a sight to behold. The road is used for logging purposes but once featured herds of cattle and their drovers who were charged with the task of fording the Sounds of Sleat with their cattle on the journey from Skye to lowland market places. General Wade (or was it Thomas Telford?) dropped by this way too and constructed the odd military bridge along the road now taking the weight of logging lorries to its credit. At various intervals there are passing places and the odd barrier shielding the tight corners and sheer drops but not everywhere by any means so keep a sober head! Before actually entering the village there is yet another sight to be aware of, the Hanoverian barracks which sits in scrubland to the left of the road. Upon my last visit the much ignored building surround by wire fencing had lost none of its interest due to the effect of the neglect offered it. Although fenced off from the public, I just had to crawl through a hole in the cordon and take a closer look at this scene of activity during the past. Apparently Bonnie Prince Charlie’s troops had commandeered the building during the time of the ’45 rebellion – how could anyone with a trace of romance in their soul drive past such an artifact of a different age? Glenelg boasts but one watering hole – The Glenelg Inn. Boswell and Johnson recorded their disappointment at their lodgings in the hostelry in their separate tomes. The fact that the intrepid two were hugely disappointed at their place of rest after a hard day tramping on pony back over the pass need not deter the reader or potential visitor. Boswell’s mention of ‘rough rushes on the floor to sleep upon’ has changed slightly in the modern era. Perhaps the two things that Glenelg is best known for are its excellent examples of Pictish Brochs – ancient funnel-shaped dwellings. Dun Telve and Dun Todden are secreted away up a very quiet lane running through woodland. Their aspect helps to aid the imagination in thinking about those days 2000 years before Christ and the way these ancient and hardy people lived.